Sir John, 4th Baron of Chalkstone, inherited an estate deep in debt even before he came of age and the responsibility as well for five younger brothers. After ten years of hard work and self-denial he has finally done it: The debts are paid off; the estate is flourishing. Time to go looking for a bride! The right one just is not there for him among the ladies of the countryside. So the attractive nobleman takes himself to London – and meets there the enchanting Louise Staunton. With his customary energy and strength of purpose, he goes about winning her over. 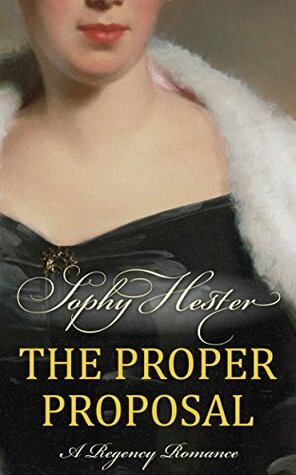 Sophy Hester is a talented writer who brings the regency world to life in this fun, endearing tale. Sir John is a very likeable and romantic character. He knows what he wants i.e. Louise's hand in marriage, and doesn't waste any time in securing it. He is instantly smitten with her and is quite charming in his attentions to her. However, their hasty engagement is only the beginning of their adventure. The supporting characters were excellent and provided further romantic entanglements and mischief. I particularly enjoyed the scene where Louise and Victoria meet Lester for the first time. I found the gruff Lester to be very intriguing and I delighted in their interactions with him. I loved how rude and gruff he was while being a gentleman and helping the ladies in their predicament. Sparks were flying between him and Victoria. I really want to read Victoria and Lester's story and so I will be waiting impatiently for future publications. I loved the use of language in the telling of this story. Devoid of Americanisms and modern phrasing it feels authentic to the time period but at the same time easy to read. My favourite things about the story was the humour that ran all the way through the book. Witty banter and the humorous situations the characters got themselves into made for very entertaining reading. The match making and side romances also kept the story light and fast paced.